After the implementation of GST, the handloom weavers have seen a decline in their earnings, says Donthi Narasimha Reddy, an independent textile expert. August 7 is National Handloom Day and it may be worth pointing out that those engaged in this traditional art, specially the weavers, seem far from happy. Estimates vary, but the number of people engaged in handlooms appears to be steadily declining. 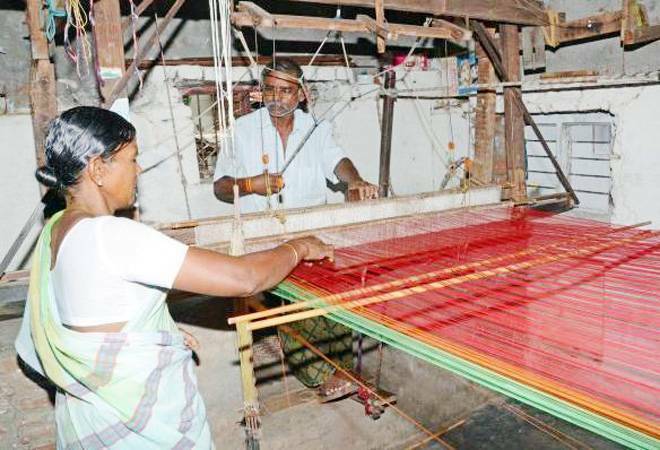 According to Donthi Narasimha Reddy, an independent textile expert, who has tracked and studied this sector closely for the past two decades, says, "The number of people engaged in handloom sector nationally is about 10 per cent of what used to be a decade ago." He says this is happening largely due to the government apathy, which is evident from low budgetary support and a fibre policy that encourages man-made fibre as against natural fibre. "In addition to this, after the implementation of GST (Goods and Services Tax), the handloom weavers have seen a decline in their earnings." Reason: Goods worth less than Rs 1,000, attract 5 per cent GST and those above Rs 1,000, 12 per cent and since most handloom sarees tend to be above Rs 1,000, they tend to attract a higher tax. Reddy is unable to quantify the actual impact but says, that from his visits to the field, he gets this sense as most handloom products tend to cost more. For instance, a typical pochampally saree would cost around Rs 4,000, but added the tax could prove to be an added disincentive. Before GST came into being, there used to be no tax on the handlooms. And now as a result, many master weavers are unwilling to invest more into the business and are moving to other businesses, with some dabbling into real estate. Part of the problem as far as taxation is concerned, says Reddy, is that many weavers and master weavers are old and may not be quite comfortable with the new norms, which include an understanding of input credit and dealing with the challenge of locked up capital. Reddy feels the solution lies in withdrawing GST on handlooms and then increasing the national budgetary allocation for the sector, which is less than Rs 1000 crore currently. He says that the sector needs at least three times more allocation. Arvind Singhal, chairman and managing director, Technopak, a leading management consulting firm with sharp focus on retail and e-tailing among others, points to some fundamental issues with the handloom sector. "We need to get the consumers today excited about the product and second, these products need to be sold in the right retail environment. There could be mechanisms created by the government to incentivise modern retail to showcase the handloom products. It could begin with just 10 per cent of shelf space and that could translate to millions of square feet of shelf space," he says. Singhal feels there is also a need to modernise the designs.